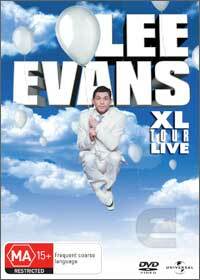 Although Lee Evens is generally associated with comedy such as the West End show “The Producers” or “Something About Mary”, the Lee Evans 2005 XL Tour is all about Lee doing what he does best and that’s his stand-up act. Filmed during his 2005 tour, his unique comedy and anecdotes will suit a wide range of people and is easily one of the funniest stand-up gigs that I have seen in quite some time with no holes barred. Even though Lee may have a innocence about him, his wit and charm will soon dissolve any misconceptions that also takes the Mickey out of pop culture and everything from sports to the ozone layer will be covered. Although the humour is largely UK grounded, Australians will have no problems in understanding and enjoying this first class performance.